This is the second part of a two-part piece. The first part, posted last week, can be read here. When I tell people I was home-schooled, they think one of my parents must have been a teacher (or at least educated beyond GCSEs), or that I had a private tutor. I’m met with faces of disbelief when I try to explain that I didn’t have a teacher at all. 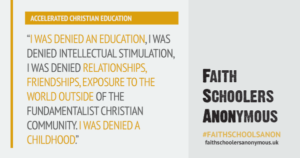 I could memorise the information I was fed by Accelerated Christian Education (ACE) in their published booklets, but if I didn’t understand, or had questions, or wanted to learn something outside of that very narrow, biased curriculum, I had nowhere to turn. I feel like I didn’t learn anything at all over the four crucial years between 13 and 17. I wasn’t supervised on any level. After an initial period of enthusiasm for home-education, my mother lost interest and indeed the energy to try and make sure five young children were engaged with their studies. Most days, the youngest kids would be taken out to run errands and make visits to friends with mother, while the (slightly) older children were left in a house to get on with chores, clean and cook dinners. This is how I spent the majority of my days – keeping house and child-minding. Because PACEs (Packets of Accelerated Christian Education) only require those learning from them to read a comprehension text and fill out the blanks in the sentences that follow, or to answer questions by slightly rewriting what you have just written in the text, it is very easy to fill out without any understanding or gaining any knowledge from them. What is more, the child is meant to mark their own work by checking their answers against an answer booklet. If supervised, the child should ask permission to mark their work. However, alone at home, it was easy to cheat. Entire PACEs could be filled out in one go by copying from the answer book. Without an atmosphere conducive for learning, with nothing to inspire or engage the mind and with no adult attention whatsoever, it is surely no surprise that the ACE curriculum, such as it is, would be misused. What is more, as home-schoolers, we would only be inspected once a year at most. We would know of the date of the visit in advance, allowing us to knock-up a portfolio of examples of what we had been doing the past year. The portfolio would largely be made up of cute photos of us all crafting. Here we are basket weaving, here we are oil painting, here we are stroking a rabbit and learning about animal-husbandry. On the day the inspector would come, I would be in the kitchen making home made scones to offer him. We would be so pleasant and twee, how could anyone think that these children were being neglected in anyway? The inspector would then have a chat with the parent rather than the child who would be left alone for another year. When thinking of home-schoolers, people tend to worry about their social skills. Will they be able to integrate into society later in life? Will they be super nerdy and unable to socialise? While I’m sure being home-schooled can make things more difficult due to the physical isolation from other children, I believe this is not as damaging as the isolation that comes from being totally alienated from the culture, common knowledge and shared experiences of the majority of the population. I put my social anxiety down to the deep inferiority I was left with once I entered the outside world and found out how very alien I really was. I didn’t seem to know anything that anyone else knew; from basic math, science, geography and history knowledge to understanding popular culture references, ways of communicating and finding areas of commonality with others. I couldn’t spell well, my vocabulary was restricted, I didn’t know the names of countries and capitals, I’d never been abroad. I hadn’t watched TV or “secular” films. I didn’t know any songs on the radio or the names of any celebrities. Wherever I went, I was always the freak and the outsider. A quote from the first part of this piece. The combination of physical, intellectual and cultural isolation has resulted in my suffering from social anxiety disorder, selective mutism, generalised anxiety disorder and chronic depression. If I had had at least one of those areas intact, had I been allowed to develop my mind, broaden my understanding of the world, meet people different from myself, I am sure my eventual transition into the outside world would have been a lot more manageable. I don’t know what my future would have looked like if there wasn’t an intervention around the age of 17. This did not come from a government worker or any other official. Simply, my mother had a nervous breakdown and I could no longer safely live in the same house as her. This being known within the church, another family took me in temporarily. I continued to do my PACEs during my stay with them; sometimes I had the company of the mum of the house who was doing an Open University course, sometimes I was alone because the parents were at work and their two children at school. They had a daughter who was my age and she was applying to do her A Levels at a local grammar school. They thought, why not try to enrol me as well? This was how I escaped. The school took a chance on me. A family supported me. Of course it was extremely challenging entering the school system, but that’s more than I can say here. Ten years later, I still feel the effects of having been stunted in my education and development. I feel I was prevented from achieving my full potential, even from achieving a small percentage of my potential. I lost years of my life that I can’t get back and the consequences of which I will always have to live with.